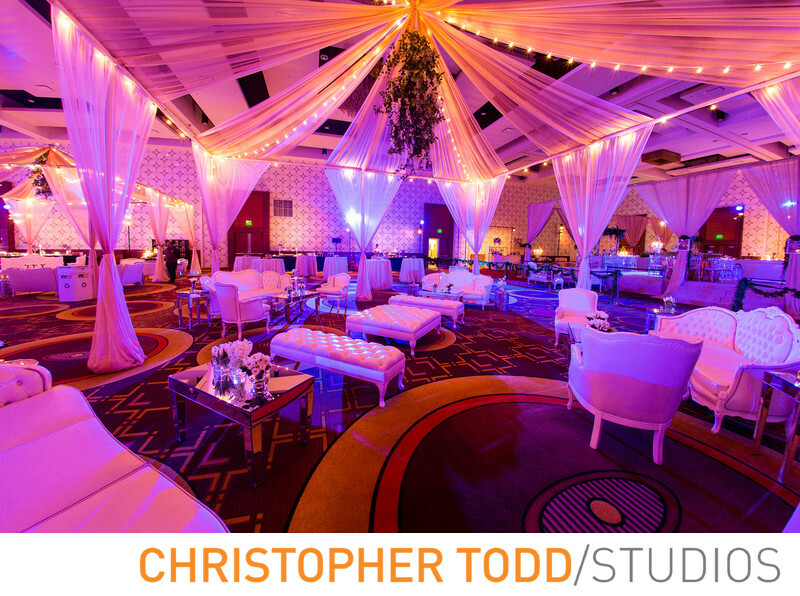 When photographing events at Beverly Hilton I know the space will be transformed into an elegant venue. This luxury hotel is known for its elegant accommodations fit for the stars. Its no wonder Herbalife chose this venue for their company holiday party. The drapes and lighting set the mood for celebration. The custom design and lounge furniture made the evening comfortable for all guests. To make sure I take a great photo capturing the light and the way the room looked I used a long exposure along with a wide angle lens. This helps me take great photos of the event space before guests arrive. Location: 9876 Wilshire Blvd, Beverly Hills, CA 90210. 1/4; f/8.0; ISO 500; 15.0 mm.